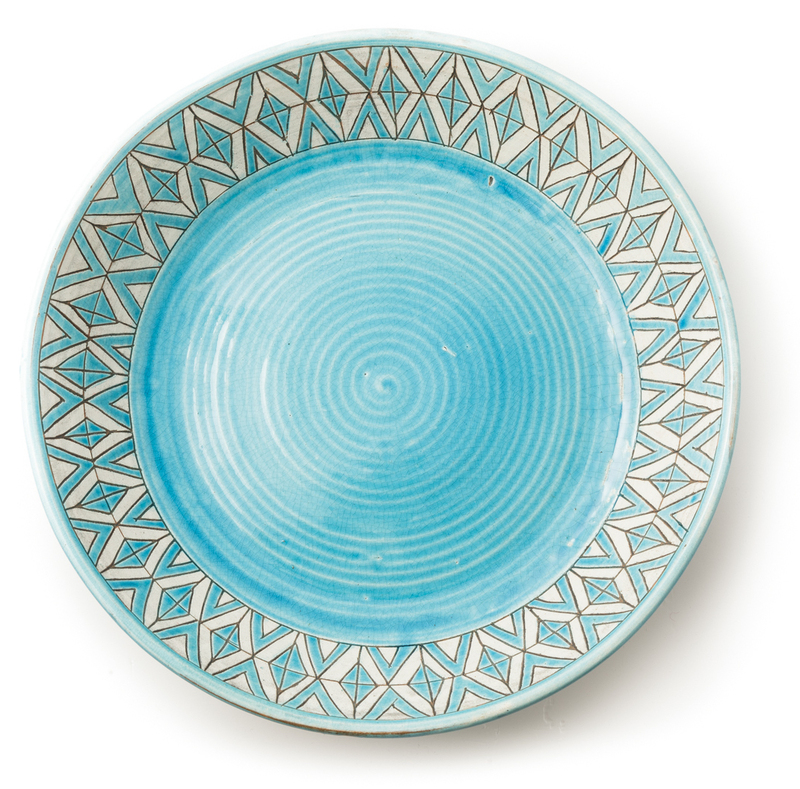 Unusual and balanced decorations enrich these lathe-crafted, hand-decorated ceramic plates. The alternations of decorative geometrical elements and one-colour surfaces are designed to enhance the forms from different perspectives. 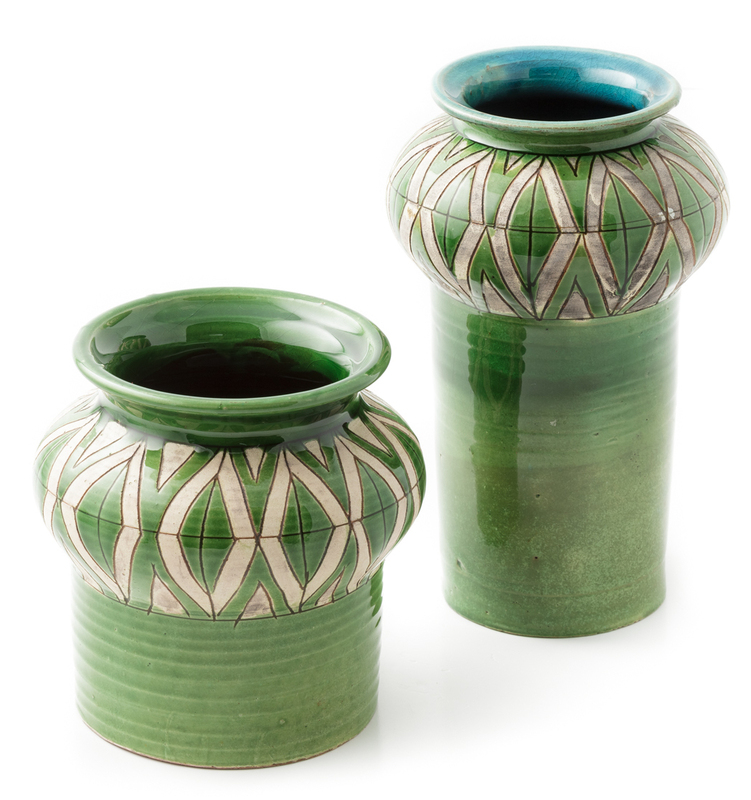 Ancient majolicas inspire these lathe-crafted hand-decorated ceramic jars. The geometrical decorations, hand-crafted following the tin-glazed slip technique, undeline their different shapes and colours, marks and solid fields of colour. The cylindrical vases featuring camber and calibrated geometric decorations, are lathe-made and decorated manually. As precious as ancient majolica, featuring a new style linear design, they are available in various colours. 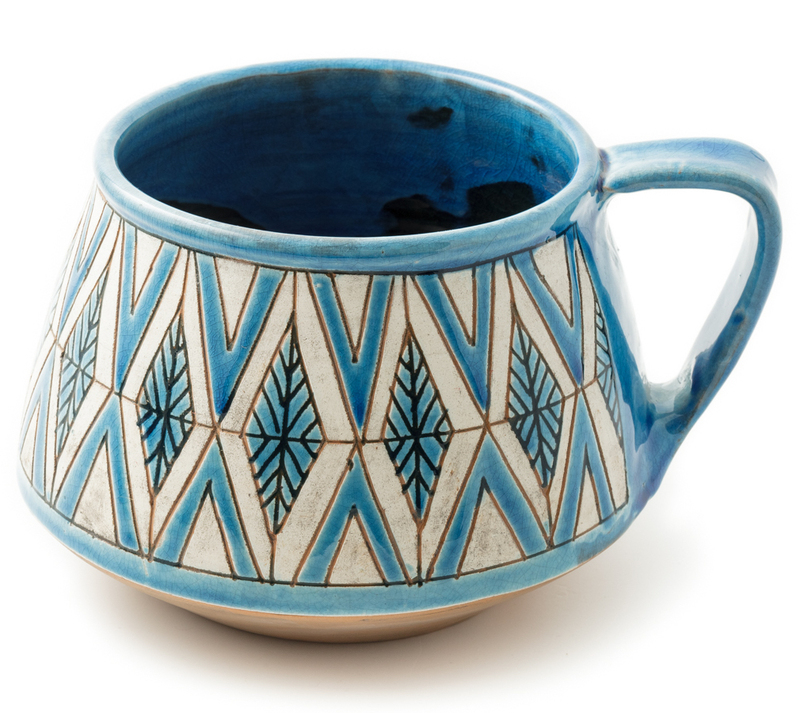 These lathe-made, hand-decorated ceramic jugs are inspired by ancient majolicas. The geometrical decorations, skillfully decorated by hand with slip and tin-glazing techniques, underline their balanced different shapes and colours, their mark and solid fields of colour. The stylised hen, a distinctive element of local iconography, acquires new expressiveness in the interpretation offered by the artist in this series of ceramic vessels, lathe-made and finished with accurate plastic additions. Technical mastery is the distinctive feature that characterizes the production of ceramics crafted by Francesca Chessa, the result of rare skills combined with excellence training. Her style combines refined techniques echoing ancient and precious majolica with sober local traditions. The potter completed her art studies at Nuoro vocational schools, where she learnt how to craft ceramics and specialized as a potter in Montelupo Fiorentino. In her studio, her granfather's refurbished stables located in the municipality of Loculi, a village of shepherds and farmers between the Barbagia and the Gallura areas, she keeps pursuing a dialogue with the territory, through an active collaboration with local venues and museums dedicated to traditions. 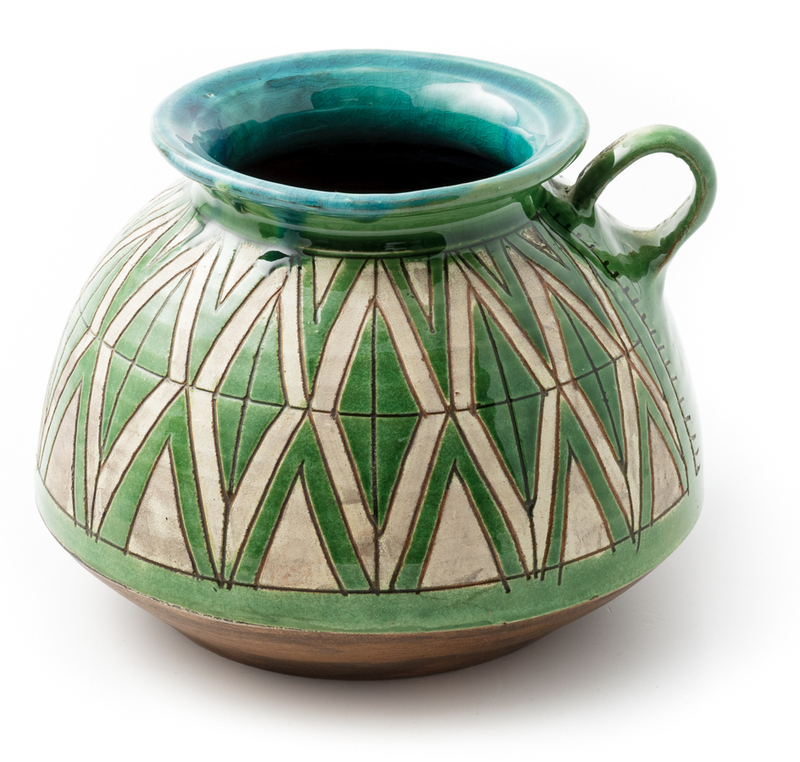 Francesca Chessa's ability in the use of the lathe is expressed in sublime pottery, items of daily use that she decorates with intricately balanced geometric patterns, featuring complex weaves and vibrant fields of full colours. The sophisticated Brocche collection includes pitchers of various colours and balanced geometric patterns. The varied collection of centerpieces, included in the Piatti centrotavola set, features decorations designed to be appreciated from many perspectives. 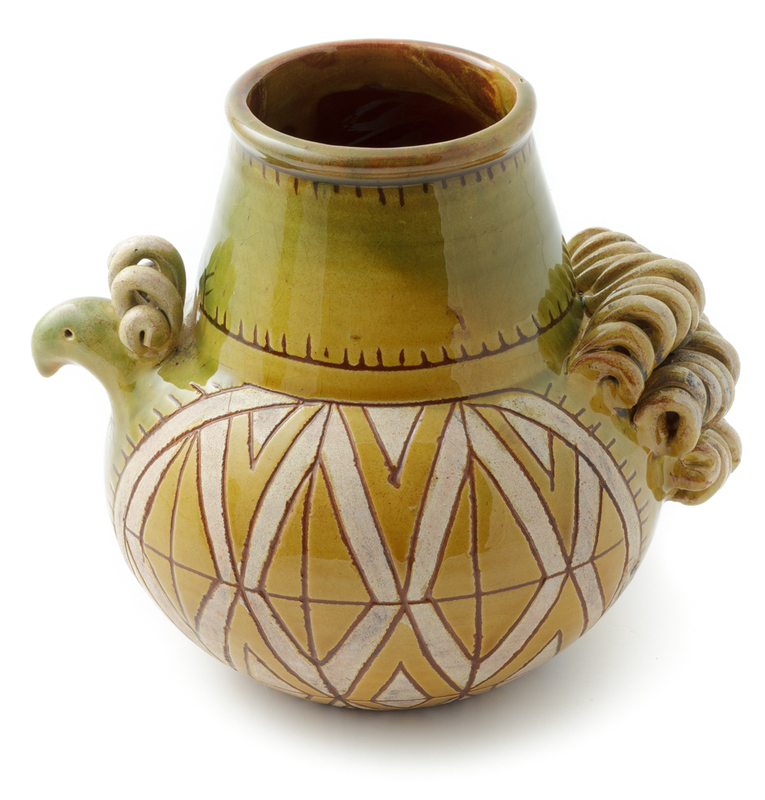 Gallinelle, pots with refined additions, are inspired by the elegant themes of local tradition. Here are some examples of her extraordinary collection. This expert potter decorates clay with white graffito slips and coat them with coloured tin-glazes. She has developed special finishing procedures, using oxides and waxes, which give the ceramic surfaces a burnished effect, resulting in intentionally worn-out aesthetic and waterproof effects. Enamels are made of non-toxic materials since they are intended to be used as food containers.